The sunshine state offers visitors a diverse array of amazing experiences—from sophisticated cities rich with cultural offerings to sleepy seaside towns with friendly locals and casual hang-outs. And while there’s tons to see and do on land, there’s nothing quite like experiencing all of Florida’s sun-drenched beauty, including miles of pristine shoreline while cruising on a boat in the crystal blue waterways. And because there are so many options for Florida boat tours and day cruises, this guide will help you decide which one’s right for you! One of the most unforgettable day trips on the water you’ll ever take in Florida is a visit to Dry Tortugas National Park and historic Fort Jefferson aboard the Yankee Freedom III. 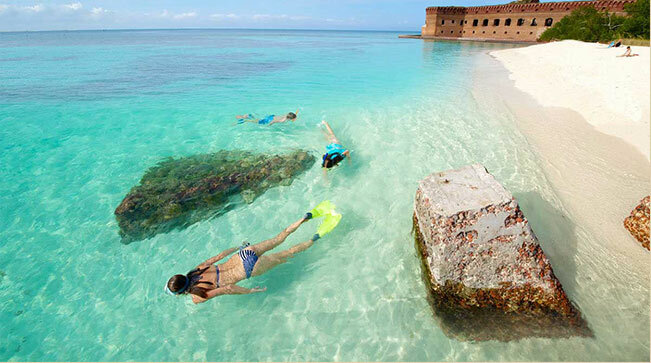 The Dry Tortugas sit just 70 miles west of Key West in the midst of the azure Gulf of Mexico waters. A secluded cluster of tiny islands with a Civil War fortress onsite, this magnificent natural attraction is one of the most unique places on earth—and the best way to visit is aboard the Yankee Freedom III, the park’s official ferry. A boat tour unlike anything you’ve ever experienced, the Yankee Freedom’s high-speed, state-of-the-art catamaran, complete with expansive sundeck and spacious air-conditioned cabin, fresh water showers and restrooms, will transport you in comfort and treat you to gorgeous views, warm ocean breezes and the possibility of seeing bottlenose dolphins, sea turtles and more. The Yankee Freedom III’s onboard naturalist will also share fascinating facts about the area with you along the way. Spend the day discovering all the eco-wonders of the Dry Tortugas, including the powdery-soft sand beaches, snorkeling and swimming in the warm clear waters or just lazing under a swaying palm tree. Tour Fort Jefferson, which served as a prison during the Civil War. You’ll learn the intriguing history of the fort and get to see the cell that once held their most famous inmate, Samuel Mudd. A day of natural beauty and adventure awaits you on the Yankee Freedom III. For those who enjoy celebrity spotting and witnessing the true lifestyles of the rich and famous, this Miami day cruise delivers in a big way. The double-decker, air-conditioned boat leaves Bayside and takes you past some of the most opulent mansions on Star and Hibiscus Islands. You’ll have the opportunity to see the homes of local celebrities like Gloria Estefan, Shaquille O’ Neal, Julio Iglesias and more, plus learn a little bit of history from the onboard guide. This 90-minute tour also treats you to views of the beautiful Miami skyline, Port of Miami, Miami Beach and Fisher Island. If you like action and your pace is anything but slow, this high-speed thrill ride is for you. Jetboat Miami offers a tour that includes speed, spins, twists, and turns and even getting a little wet. The sleek boat will transport you into some of the area’s exclusive enclaves and past the San Marco Islands, Star Island, Memorial Island and Fisher Island. History abounds on this unique day cruise in Tampa. You’ll travel in the picturesque Tampa Harbor past museums, shipyards and million dollar homes and even have the opportunity to see the Pirate Ship Gabrielle and the lovely Plant Hotel up close. The tour guide shares fascinating facts about the city, including how Tampa grew from a small Spanish outpost to one of the fastest growing cities in Florida. Spend an afternoon learning about the famous Sponge Docks and watching the seas for dolphins, sea turtles, manatees, and other marine wildlife. This day cruise takes you along the Anclote River into the Gulf of Mexico and includes a narration from the captain about the history of Tarpon Springs. You’ll have a chance to see the restored Historic Anclote Lighthouse on Anclote Island when the boat docks, allowing time for a dip in the water and some shell hunting. There’s a cash bar onboard featuring a variety of cocktails including frosty margaritas, beer and wine and you’re welcome to bring along a picnic lunch. This evening tour takes you on a journey through the beautiful freshwater tributaries along the St. Johns River. Many guests have spotted a variety of wildlife during the tour including alligators, turtles, herons, bald eagles, wild boar, deer, manatees, egrets and more. The ideal way to see the sunset over the water, this tour is great for couples, groups, and families. It’s about two hours long and includes a ride through Trout Creek, Six Mile Creek and the Bayard Conservation Area. You’ll have the opportunity to view some of St. Augustine’s untouched beauty and gorgeous waterways. Families and those who enjoy spotting marine animals will enjoy this special day tour out of Fort Myers. A smooth ride to little-known manatee hideouts, the Eco Boat Tour treats you to a look at these gentle sea cows in their natural habitat. Tours are for small groups and depart morning, midday and afternoon. The Dolphin and Wildlife Cruise travels to Estero Bay Aquatic Preserve, home to area manatees, dolphins, seabirds and more. An eco-tour that travels past rookery islands, mangrove islands and Lover’s Key State Park, the trip includes commentary from a certified Florida Naturalist so you can learn all about the ecosystems. Grab the family or some fun-loving friends and head over to the Manatee Queen Boat Tour in Jupiter for an afternoon of sightseeing on the water. This laid-back tour transports you along the Atlantic Intracoastal and past many of Florida’s most luxurious estates on Jupiter Island. Snacks and beverages are available for sale onboard and you are welcome to bring along your own snacks and drinks.